The diagram below can be used to estimate charging speed for electrical vehicles. The default values are for single phase 240V, 32 amps, 7.7 kW, 18 kWh/100km driving consumption - and charging speed 43 km/h. 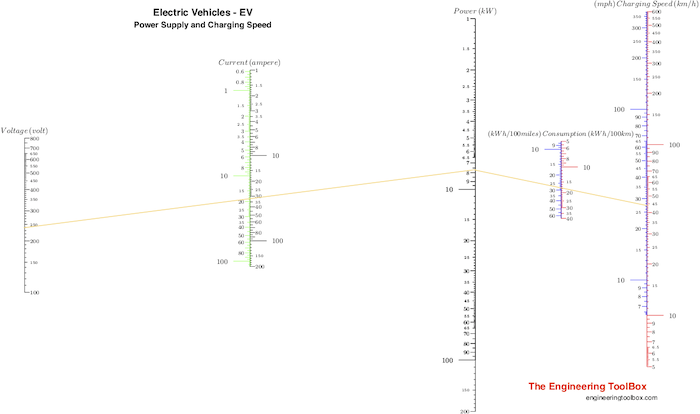 Download and print Electrical vehicle charging speed diagram! The diagram below can be used to estimate charging speed for electrical vehicles. The default values are for 13 minutes, 9 kWh, 42 kW, 18 kWh/100km driving consumption - and charging speed 230 km/h. 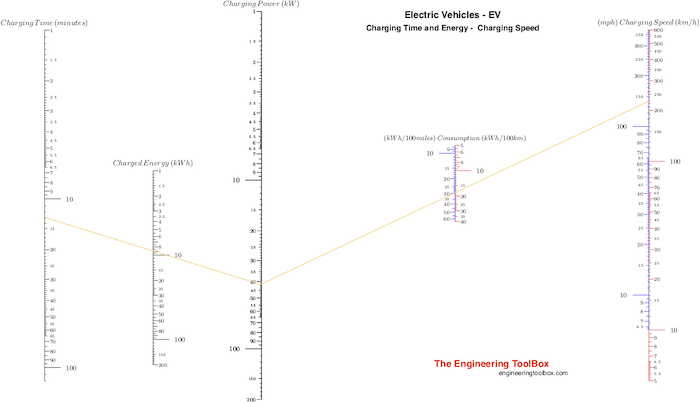 Download and print electrical vehicle charging energy, time and charging speed diagram! Engineering ToolBox, (2019). EV - Electrical Vehicle - Charging Speed. [online] Available at: https://www.engineeringtoolbox.com/ev-electrical-vehicle-power-supply-charging-speed-d_2154.html [Accessed Day Mo. Year].